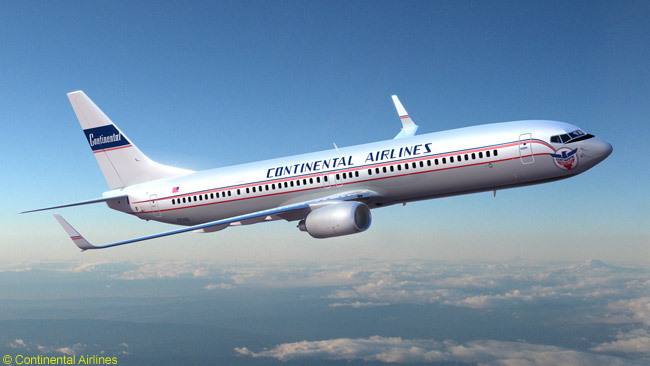 Continental Airlines has taken delivery of a new Boeing 737-900ER painted in a retro livery to commemorate the airline's 75th anniversary on July 15. The new aircraft’s retro livery, which the airline started using on aircraft in 1947 and is called The Blue Skyway, was selected by Continental employees. Continental has displayed the new aircraft at each of its three hubs for anniversary celebration events for employees and retirees. The aircraft made an appearance at Houston Bush Intercontinental on June 25 and at New York/Newark Liberty and Cleveland Hopkins on June 26. Continental traces its history to Varney Speed Lines, started in 1934 by Walter T. Varney primarily to carry U.S. mail. On July 15, 1934, the airline launched its first flight, carrying 100 letters and no passengers between Pueblo, Colo. and El Paso, Texas. At the time, Franklin Roosevelt was president, the average U.S. annual income was about $1,600, a new car cost $625 and a gallon of gas cost 10 cents. Walter Varney focused on the new airline’s fleet, calling Continental “America’s Fastest” due to its speedier aircraft. Varney Speed Lines became Continental Airlines in 1937 under the leadership of Robert F. Six, who captained the airline into the jet age and expanded its reach for more than 40 years. In 1944, passenger revenue exceeded revenue from carrying mail for the first time in the airline’s history. Under Six’s leadership, Continental in the late 1940s became one of the first carriers to experiment with coach fares, and established first-class “Gold Carpet Service” in the late 1950s.